In the last century, changes in land management and loss of natural habitat have led to a dramatic decline of the insect across northern Europe. By the 1980s in the UK, field cricket numbers had dropped to fewer than 100 individuals, all found only in one location in West Sussex. A decade later, conservationists began catching young field crickets and moving them to new sites across Surrey, Sussex and Hampshire in a bid to save them. Image caption Mike Coates of the RSPB at Farnham Heath Reserve. 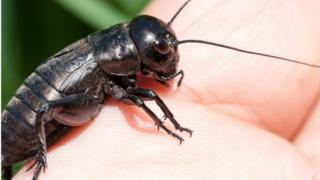 Mike Coates says nowhere near enough people get to hear the sound of the male singing cricket, as there are probably only eight populations left in the UK. "Extinction is something tragic," he says. "These things have been around, they've been part of people's lives here, they've been written about, they've been significant in that way for centuries. "Are we really going to be the generation that loses them? That would be appalling." The project to move young crickets to new areas is showing signs of success. A colony of around 300 has become established from only 12 individuals, within five years, at the RSPB's Farnham Heath reserve. This has become one of the largest field cricket populations in England. The aim is to establish a second population next to the Rural Life Centre in Tilford, Surrey. In May, conservationists from the RSPB moved a small number of crickets to the new site. Using a technique known as "tickling", the young field crickets, known as nymphs, were tempted to leave their burrows and then captured. "We want to get them translocated and a new population established in a part of our reserve here that's open to the public," explains Mike Coates. "So, that lots more people get the chance to hear this wonderful noise and to find out more about these fascinating little insects." Image caption The crickets can only walk or hop. They don't travel far from their burrows. The male's courtship song is made up of normal chirps or trills alternating with high-pitched chirps given when a female is nearby. "They sit there and they produce this fantastic chirruping noise," he says. "The females listen out and think, 'Hmm I don't like the sound of him, not so fussed about him, Oh he sounds interesting'. "And, then the females will go out and go to the burrow of the males that they find the most appealing, and then the females will lay eggs." The young larvae, called nymphs, hatch and develop over the late summer and autumn. They then dig a burrow to hibernate, while the adults die-off. In the spring, the nymphs emerge, to start the cycle over again. Hayley, a volunteer at the reserve, is helping to survey the singing male crickets. "I think it's just restoring things back to how they should be," she says. "It's part of the life cycle. These [crickets] will be food for other animals, which are native to this area, and it will bring other local animals back and really restore the heath to its former glory."